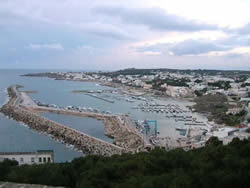 Santa Maria di Leuca is the small town located between the two seas. It is 800 Km from Africa. It has a lighthouse of 47 meters and a sanctuary situated on the highest part of the promontory. It gave hospitality to pilgrims from all over the world. It is known for its villa of the end of the nineteenth century that has an oriental and neo-classic style. Once Punta Ristola has been doubled the landscape changes considerably: the high and wild coast changes into lower cliffs and sandy extents, red lands and vineyards interrupted by towers of the sixteenth century. The first small village is PatA? with its S. Gregorio tower. It was Vereto harbour, ancient messapic town destroyed during the IX century. Going up towards North there is Torre Vado (Morciano di Leuca) and Pescoluse, other seaside resorts such as Torre Pali (Salve), Torre Mozza and Torre San Giovanni (Ugento). This coast line was once very marshy. After 5 Km there is Ugento, ancient messapic town, with still some parts of the ancient walls. It is the seat of a Civic Museum that has many objects of the past. The castle is located 100 meters above sea level and the cathedral is of 1700. Before reaching Gallipoli there is Torre Suda, Marina di Racale, Mancaversa and Torre Pizzo, a long extent of beaches and low rocks. Now one reaches Gallipoli with its castle surrounded by high walls, the cathedral dedicated to S. Agata with the Baroque faAade and other churches scattered around the city, the harbour for its trades and fishing, the Greek and Roman fountain and the courtly Palaces. On the horizon S. Andrea Island with its lighthouse is dimly seen. Leaving Gallipoli and passing Torre Sabea, there is Rivabella and Lido Conchiglie, an extent of dunes, the wonderful Montagna Spaccata (the splitted mountain). 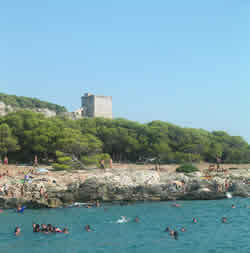 Immediately after there is Santa Maria al Bagno, already famous for its thermal baths and its roman harbour, a pleasant bathing town and with several dated buildings of the end of the nineteenth century; Santa Caterina, protected by Dell’ Alto tower that dominates it from the Ravine of the Damned and from the tower of the XVII century that bears the same name. In this area the naturalistic Park of Porto Selvaggio is remarkable, with Capelvenere Grotto and Uluzzo Grotto. The waters of Uluzzo bay are inviting and transparent. In Cavallo and Uluzzo Grotto there are the prehistoric archives. Porto Cesareo, already a basilian centre, today is a remarkable touristic centre with 17 Km of beaches that face towards an archipelago of small islands of which the most known is the Conigli (Rabbits) Island. Also from this side the coast appears at intervals high and rocky and at intervals low and sandy, whereas the inland is composed by thick forests and bare rocks. In this area there are also towers together with farms, olive-yards and vine-yards. Immediately after there is Torre Chianca that faces the small Malva Island, Torre Lapillo with its beautiful inlet that, after Torre Castiglione and Torre Columena, gives way to all the coast road up to Taranto, the end of the Salento land. It can be the long term benefits you are looking for, or the learning is just a time to relax, while some pursue it as look for more info a hobby.